Why do Godzilla movies appeal to us G-fans so much? Is it just Godzilla? Heck no, it's also the other monsters that have appeared in his movies! Throughout Godzilla's movie career, he has starred along with other daikaiju (giant, strange monsters). 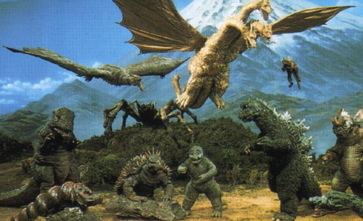 Below is a list of all of Godzilla's fellow monsters, and almost all of the kaiju that have appeared in the Godzilla series. A good majority of the information in this section are from the great Godzilla book The Official Godzilla Compendium. Some of the facts are also from some of my own observations from when I've watched a Godzilla film. I have not intended any copyright infringement, so please don't sue.